Schedule your move out cleaning together with a removals service or separately if you wish. We will provide you with a free no-obligation quote, which will include a breakdown of all the costs, based on your moving needs and assistance requests. On that note, the professional move out cleaning is charged per job, which means that the service is not limited by time. You can book your cleaning session for any day of the week, including public holidays. It is much more effective to clean your house, rented flat or office after it has been completely emptied of your possessions, personal belongings and furnishings. Hence, the moving team will pack (if requested), load and transport your stuff before the move out cleaning team gets in. Naturally, this does not apply if you are vacating a partially or fully furnished rented accommodation. In this case, we request that you pack your personal items and ensure that appliances (fridge, freezer) are unplugged and defrosted. The professional move out cleaning team follows strictly a thorough checklist. They are equipped with everything they need to deep clean the property. Every room, surface and fixture will be polished, including floors, interior windows, window sills, furniture tops, storage units, skirting boards, light fixtures, knobs and handles, kitchen appliances, bathroom fittings, etc. 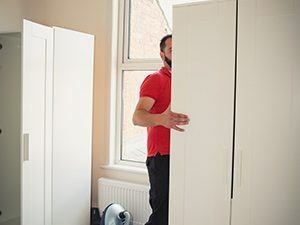 Hard-to-reach places will be also given a special attention, whether the cleaners need to clean behind the oven or access the top of a wardrobe. Upon request, carpets and soft furniture can be steam cleaned at additional cost. We strongly advise that you are present at the end of the move out cleaning service and inspect the job results, especially if you are expecting to get your refundable security deposit in full. Either way, even if you are not a tenant who has paid upfront a security payment in order to rent, you will still have 72 hours to get in touch with us if you feel that the cleaning has not been done to your expectations. We have designed a complete relocation package that can take care of every facet of your move. Depending on your individual circumstances, we can pack your possessions with quality materials, load, transport and deliver them to your new address. In addition, we can send a professional move out cleaning team to deep clean the vacated property. The move out cleaning service comes with the assurance that if you or your landlord has issues with the cleaners' job performance, the team will come and re-clean the areas of concerns for free. What you need to do is to contact us no later than 72 hours from the day of your appointment. The professional cleaners who will handle your end of tenancy cleaning are familiar with the checklists used by letting agencies and landlords. In other words, they will make sure the priority areas are properly cleaned so the property can easily pass the check. We will personalise your service to meet all your relocation needs. Whether you wish to place your belongings into storage for a period of time, have a load of old furniture or any other waste disposed of, or you require special packing and handling of antique items, we can help. The Fantastic Club opportunity With our Fantastic Club, you can lower the prices of all our services with 10% by simply becoming a member. The annual fee also gets you preferential booking slots, and you will be able to make use of all your member-only discounts even on the move by using our GoFantastic app. There is nothing more stressful than losing your security deposit on top of packing, moving out and looking for a new place to rent. With our reliable, 72-hour guaranteed end of tenancy cleaning assistance, you can rest assured that the funds you’ve paid upfront will be returned in full so that you can secure more easily the rent for your next accommodation. Need to rent out your property again after messy and irresponsible tenants have left it in a right state? Worry not and invest their security deposit in a professional cleaning service with us! We will send a dedicated team of move out cleaners who will remove every trace of grime and dirt and leave you with a spotless property, ready for letting. We have helped a number of agencies on a regular basis ensure that the properties they let are clean and presentable to accommodate their new tenants. We are experienced in serving multiple-property owners who can benefit from our preferential rates, as well as from a customised assistance, courtesy of the dedicated personal account manager we will assign them with. Whether moving in a newly purchased house or a rented place in London, you may feel dissatisfied with the way it has been cleaned. This is where we can help by sending a team of hard-working move out cleaners who will ensure that your new home is deep cleaned and sanitised to the highest standard. You can also hire us if you’re putting your property on the market and wish to improve its saleability. All items should be moved before the cleaners arrive. Otherwise there might be difficulties for the service to be performed. So, make sure that the removals is complete before the beginning of the move out cleaning service. Mind that your fridge and freezer should be turned off 24 hours before the movers come to your home. It's a specific electronics which requires proper care if you want it to continue functioning with the same efficiency. Talk to your utility suppliers and arrange the change of address with them. Notify them at least 2 months before the move so they can arrange anything related to moving their services at the new address. If you want the keys picked up and left somewhere, make sure to mention it to our representative on the phone. Q: How many move out cleaners do you send? A: This will depend on the size of your property. We generally assign a team of two professional move out cleaners to the job but we can send three if necessary to complete the task more efficiently and within a reasonable time frame. Q: I rented a fully furnished flat. Can I book just the end of tenancy cleaning service? A: Yes. You can schedule a move out cleaning service separately or in combination with a house removals service, depending on your personal moving needs. Q: What if my landlord has issues with returning my deposit in full due to the cleaning service? A: We offer a 72-hour guarantee with our move out cleaning solutions. This means that you have 3 days to contact us if there is a concern with the service. We will send the cleaners again to remedy the problem. Q: Do you serve commercial customers? A: Absolutely. We can provide move out cleaning for offices, real estate agencies, shops and other facilities from various industry sectors. Q: Can the move out cleaners wash the windows from the outside? A: No. 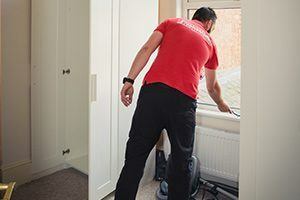 The end of tenancy cleaners lack the expertise and the special equipment for cleaning your exterior windows. Still, we may be able to arrange a separate window cleaning service for you, upon request. Q: How is the price calculated? A: The service is not charged at hourly rates, so the cleaners will stay as long as until the job has been completed. The price is based on the size of your property and on the number of move out cleaners needed to execute the service. Get Your Move Out Cleaning Now!